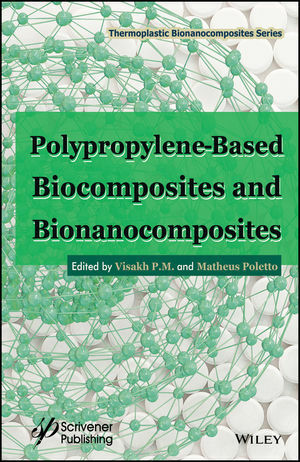 This book discusses new developments in an up-to-date, coherent and objective set of chapters by eminent researchers in the area of polypropylene-based biocomposites and bionanocomposites. It covers, biomaterials such as cellulose, chitin, starch, soy protein, hemicelluloses, polylactic acid and polyhydroxyalkanoates. Other important topics such as hybrid biocomposites and bionanocomposites of polypropylene, biodegradation study of polypropylene-based biocomposites and bionanocomposites, polypropylene-based bionanocomposites for packaging applications, polypropylene-based carbon nanomaterials reinforced nanocomposites, degradation and flame retardency of polypropylene-based composites and nanocomposites, are covered as well. Visakh P.M. (MSc, MPhil, PhD) is a prolific editor with more than 16 books to his name. He isworking as a postdoc doc. researcher at the Department of Ecology and Basic Safety, Tomsk Polytechnic University (TPU), Tomsk, Russia. He obtained his PhD, MPhil and MSc degreases from School of Chemical Sciences, Mahatma Gandhi University, Kerala, India. His research interests include: polymer nanocomposites, bio-nanocomposites, rubber-based nanocomposites, fire retardant polymers, and liquid crystalline polymers and silicon sensors Matheus Poletto is an expert in composite science working with cellulosic materials, natural fibers, natural and synthetic polymers, recycling and waste management. He obtained his PhD in Chemical Engineering from Universidade Federal do Rio Grande do Sul in 2014. He is now an Assistant Professor at Centro de Ciências Exatas, da Natureza e de Tecnologia from University of Caxias do Sul, Brazil.